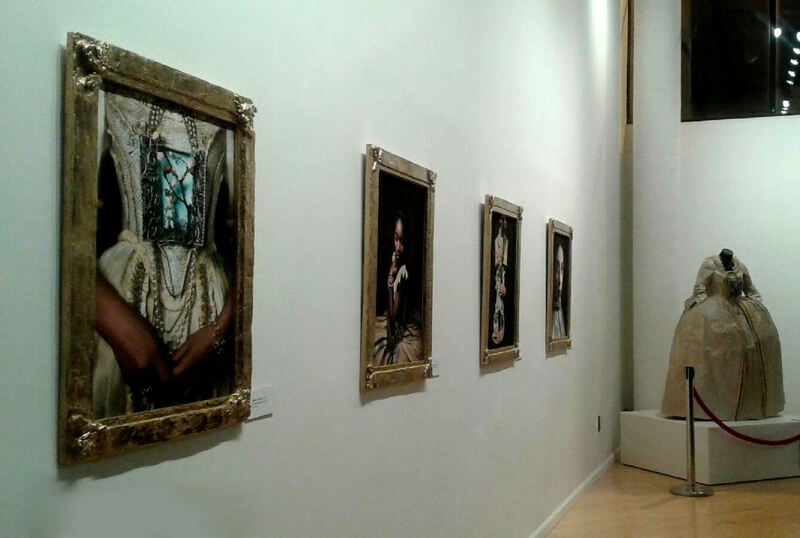 Recently exhibited at Harlem School of the Arts, Fabiola Jean-Louis' Rewriting History is an interdisciplinary series that serves up a ride through antiquity and imagination. Victorian era dresses, fashioned almost entirely from paper, become actors in a photographic essay that challenges history, reality, and time. 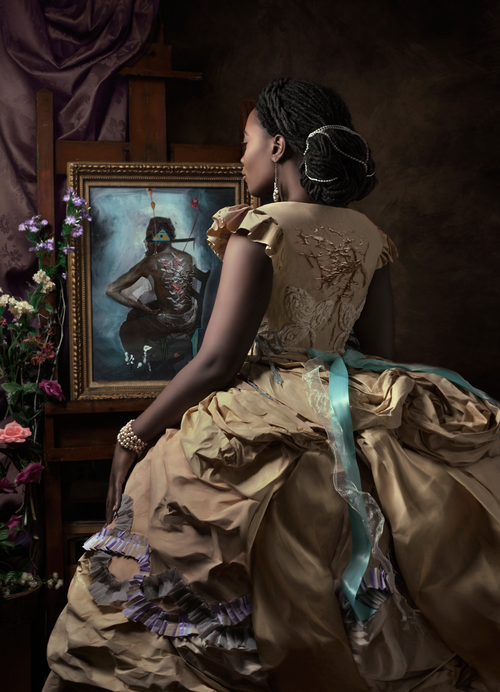 Visual, sculptural and performative at once, the work reels viewers into an alternate realm; one that heroically re-examines the past and thrusts the majesty of African ancestors -- real and imagined -- to the fore. 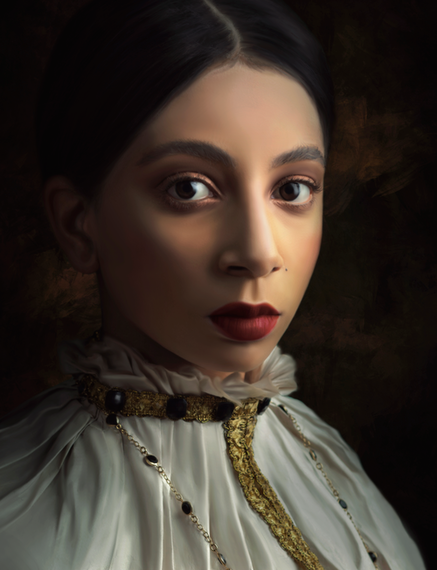 Each image has its factual, historical connection and a narrative remixed via Fabiola's multi-dimensional lens. The dresses, and their environments, are imbued with vestiges of fantasy and futurism, creating impressions that are otherworldly, palpable, and highly persuasive. 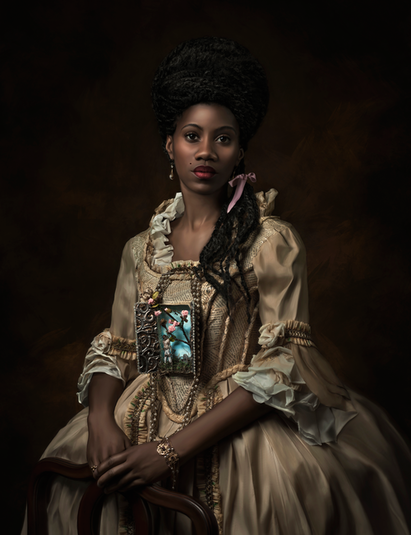 In one haunting portrait -- Madame Beauvoir's Painting -- a young woman gazes into a framed painting of a runaway slave (an adaptation of a known historic photo), revealing a gruesome and intricate pattern of whip marks on the man's back. Elegant and at least visibly unscathed, Beauvoir is absorbed in her painting, almost as if it is a mirror - the back of her own dress bearing a similar pattern of scars. 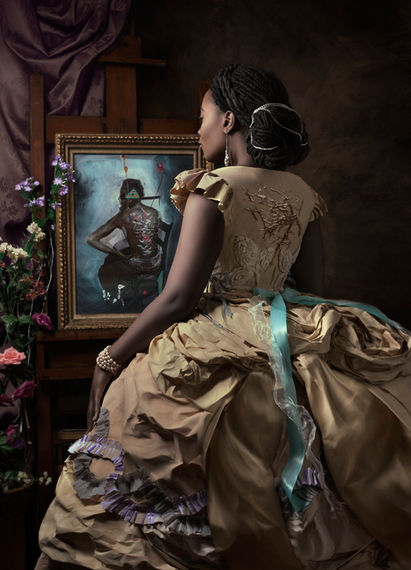 This composition, not unlike others in the series, underlines the African descendants' visceral connections to a brutal past, an inability to escape it, and the fact that it cannot be concealed by any measure of material finery. Similarly, one gown has a colorful, three-dimensional inlay of a lynched man fused into the bust. Naive and almost idyllic at a glance, upon closer inspection the inlay reads like a macabre window into the future from the past, highlighting the sobering reality that not much has changed from one century to the next. Nearly destroyed after every sitting, the fragility of the paper dresses even seems symbolic of the vulnerability of black bodies. And, the artist's use of color -- from moody hues to nearly playful brights -- is also carefully weighed to impact the dramas of each composition. To be clear, Jean Louis has designed and fabricated the garments, conceptualized and styled the sets, transformed and photographed the subjects and, at last, purposefully crafted the gilded frames in which the images are displayed. 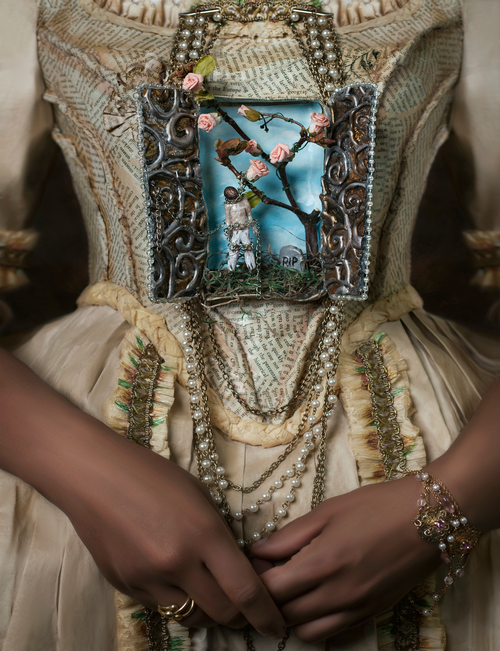 While the collection may evoke reactions from fairy-tale wonder to emotional distress, the images are, at the same time and quite plainly, breathtakingly beautiful. 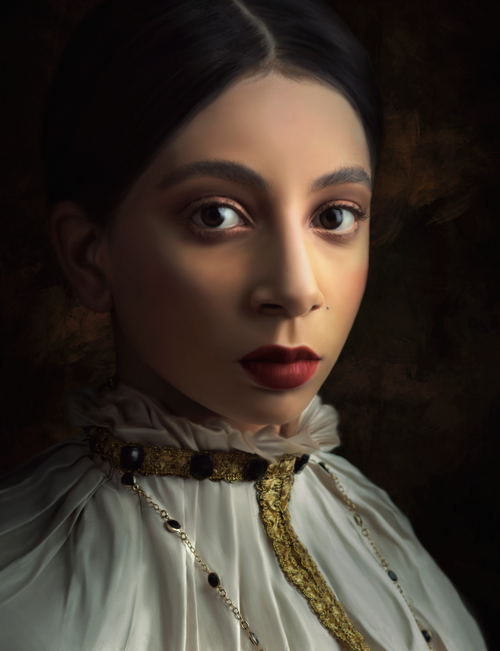 Haitian born and New York raised, Fabiola Jean-Louis studied fashion design & illustration at the High School of Fashion Industries, attended the Art Institute of Pittsburgh, and independently developed a love and talent for photography. Her Afro-Caribbean heritage, creative influences from within the home, as well as adolescent imagery, ranging from goth, punk and science fiction to urban reality, have all inspired the artist and feature in her work. It is not just the photographic eye but what Jean-Louis brings, before and after, that breathes magic into her artistry. 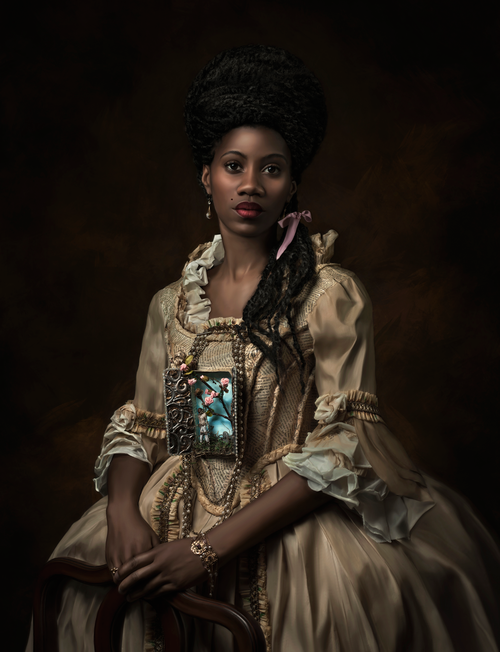 Watching the news as more black bodies were appropriated death and injustice, and the Black Lives Matter movement welled up in response, Jean-Louis wished she could rewrite history. 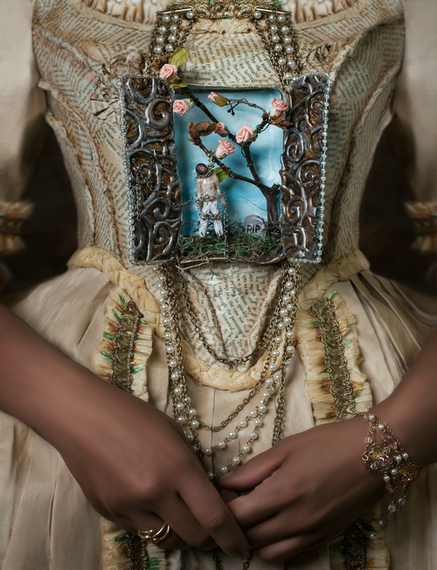 The Brooklyn-based artist had always been interested in recreating these period dresses and went to work, not only constructing the gowns, but using her technical and photographic acumen to weave each mysterious tale. Without even a single sketch, her first dress took three weeks to complete. The rest is history. Images (top to bottom): Amina (screen shot from video below); Madame Beauvoir's Painting; Rest in Peace; Madame Leroy; Conquistador; Partial view of Harlem School of the Arts exhibition. All images are limited edition archival pigment prints on hot press paper ©2016 Fabiola Jean-Louis. The artist offers a glimpse into her process below.